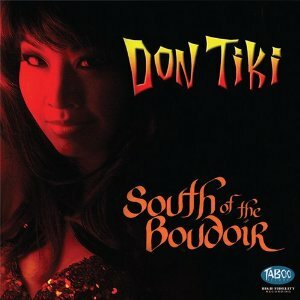 I first became hooked on Don Tiki after hearing the spooky Tiki track “The Natives Are Restless.” Further research on the band led me to discover that they had done other songs with kinda creepy titles, such as “Axolotl” and “The Hypnotizing Man.” Their debut album, The Forbidden Sounds of Don Tiki also depicts creepy idols, green fire and a human skull (carrying over aspects from the cover of The Exotic Moods of Les Baxter). Not that it effects my enjoyment of the band, mind you. Don Tiki could have never done any of those things and I’d still love ’em. The album’s opening track is actually a cover of the exotica classic, “Friendly Islands” by Ethel Azama. Bird calls lead into guiros, vibes, and keyboards under female vocals singing of a tropical paradise that’s perfect for love. The drums and cymbals are very soft and low and add to the song’s soft smoothness. There’s a vaguely jazzy vibe and guiro interlude at one point, and more calls appear as the singer takes us out. There’s a very “Bali Hai” feel to this. The instrumental “Odd Man Out” uses congas and vibe strikes to form the main beat. A harp soon joins in and the vibraphone use gets more involved, as do the guiro and piano-like keyboards. Light bass is also used at points and then the vibes liven things up again with percussion, which leads us out. There’s a definite jungle feel to this one. Despite the name, the light vibes and fast congas of “Turkish Delight” provide more of a tropical feel as they play over the occasional keyboards and harp. It only feels vaguely “Middle Eastern” later, where some exotic percussion is also added to increased keyboard use. The very catchy “The Forbidden Finger” starts with male vocals which join congas and vibes, and female vocals and flute soon follow. Keyboards, congas and vibes make up much of the song, but the flute gets some decent roles at times. In classic Don Tiki style, the singing cheekily implies both the “shh” usage of a finger and another possible meaning for the title. The band’s interpretation of G. Lane’s “Bla Bla Cha Cha” has a very Latinesque, Arthur Lyman feel. A piano-style keyboard openings things while a female singer explains (in a low and sultry voice) that the tune has no lyrics that could fit, so she’ll say “bla bla cha cha” instead. After a brief pause, it suddenly bursts into lively singing backed by a saxophone, drums and light vibes. This leads to a brief instrumental segment that’s very tango-like at times. I love the ending sequence of this track. I thought “Tinfoil Hats” would be one of the album’s horror-related songs due to the possible alien connection, but I was wrong. The keyboard, t’rung, marimbas that sound like cartoon mice running, soft cymbals and vibes all come and go at different times and sometimes overlap. This creates the effect that the song is taking place in a madman’s head. “Chinatown Bar Cha Cha Cha” has a tango-like keyboard and percussion opening, then male vocals sing of evening at a Chinatown bar and his flirtations with a female patron over the course of a few weeks. Light vibes and flute use comes into play and we later hear an interesting pick-up line of sorts about buying her clothes to pose in while he takes pictures. Drumroll, keyboards and camera clicks cleverly give way to vibes. Percussion and others pick up as vocals return to sing of the relationship’s progress. “Pussyfooting” is another instrumental that uses light, slow percussion and keyboard to give the impression of carefully tip-toeing. The keyboards are the star of the show, as they’re the only instrument to stray from main beat. The vibes get an interlude too, though. The use of bird calls returns in “Jungle Julie,” soon followed by congas and bass. Keyboards and cymbals aren’t far behind and get Peanuts-like at times. Flutes also appear, as do harps. Said harps give this a far more Middle Eastern feel than “Turkish delight” had. More calls get layered in briefly and the music slows down for a keyboard solo of sorts, later joined by cymbals and flute. There’s a return to form and then more harp use. Light marimba use takes us out with harps and light, soft bird calls. “Billions of Brazilians” begins with wild Brazilian percussion and organ-like keyboards. Mixed male and female vocals sing of the wonders of Brazil. The “Ya ya ya ya ya ya” chorus is very catchy, you will be whistling, humming or singing this after hearing it. This is followed by vibes and speedy cymbals. The singing returns again, but there is drum solo after the and chorus returns with keyboards and vibes. I love the wonderful instrumental outro. Congas and light keyboards form the beat “Pajama Tops,” which are soon layered under the vibraphone and flute. A female voice gives humorous explanation for the title at the end. Horns, congas and crowd sound effects give “The Palanquin” the feel of a Middle Eastern bazaar. Female vocals act as spice before male vocals over keyboard and congas sing of a search for Don Tiki’s hidden bar in an ancient catacomb. The keyboard and harp outro nicely leads into the next track. “Pagan Lust” is the sole co-production by Don Tiki song scribe Kit Ebersbach on South of the Boudoir, which he did with Lauritz Hasenpusch. I honestly thought this would be about what the title implied and that I could discuss how such lust appears in both Tiki and horror culture. Instead, it turned out to be the name of a fictional drink! Funky keyboards and male vocals (plus several female vocals) sing a warning not to order said drink. Light vibes appear, as well as drums. They explain that the drink is dangerous and provide humorous descriptions like “red hot lava in a cobra skin.” After a Middle Eastern horn and drum interlude, followed by vibes and light wordless female vocals, it returns to the original style for the end. The first of two bonus tracks, “Rapture of the Deep,” is both the longest track and the surprise horror connection of the album! Bubbling sound effects increase in volume while congas and “Music from the Heart of Space”-style mystical keyboards follow. Processed, whispering female vocals that sound like a sea witch tells a tale of seduction called “The Age of Love.” The overall effect is like sinking deeper and deeper into the ocean, especially if you listen in a dark room. The vocals can be hard to understand at times (Did she actually use the term “member” like I think she did?). A heartbeat effect is added over the soft keyboard solo, followed by the occasional congas and gong usage. Maracas and more bubbling lead us back to the story (over more bubbles). Be warned, though: The sea witch’s orgasmic moans towards the end will have anyone playing this at a party making a mad dash to the stereo’s off switch. The second bonus track, “In Thailand (Delmar’s Deluxe Mix),” is a repeat of track #7 with new material added to to intro and outro. Said material is mostly vocals and the sound of a bottle being uncorked. Sadly, the lyrics are still there. Special thanks to Don Tiki for the review copy!